Every now and again something comes along that has you thinking Ohhhhhhhh why has this never been done before? of course when it comes to Phone Apps and gizmo's there are a lot of gimmicks out there that are pretty much a five minute wonder. This gorgeous piece of newness really grabbed my attention. How often have you gone to get your nails done and when the technician says choose your shade, you stand there like a complete twonk staring at a wall of colour feeling totally overwhelmed and end up panic choosing a shade? I have done it many many many times. Or you have needed a nail colour to go with a particular outfit and never quite found the perfect one? If you are a complete nail polish addict whats the betting you have bought the same colour twice by accident? All of these problems are solved in one simple but brilliant little FREE App. 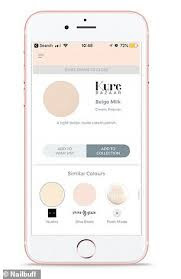 Nailbuff App lets you scan a shade on your phone of anything you like and the app will find the perfect nail polish shade for you, how brilliant to have the app search for you and find the exact shade of your outfit. You can search hundreds of shades and even search the shades your favourite nail bar currently has available. once you have selected your shades you can build up a library of your favourites so you never buy the same shade twice, you can select your shade before you even leave home for the nail bar, so no more wall staring! Brands that have already joined the App include Candy Coat, IZ Beauty LDN, Kure Bazzar which I wrote about recently here and London Grace. Android is currently under development. Post contains gifted brand/agency samples unless stated. No affiliate links.